I’m basing my current trip to Shenzhen around the district of Luohu. 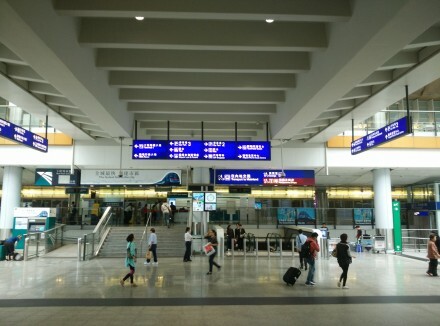 Luohu has it’s own border crossing; the LoWu station on the Hong Kong side, which is reachable via the Hong Kong train service. Today’s route sees us taking a bus and a train to the border crossing, and a proper Shenzhen taxi to my hotel. It is possible to get to Luohu via the Huanggang Port border crossing, and getting a taxi from the Port to Luohu. The SkyLimo people-carrier route from the airport to Shenzhen is still an option. Travelling in Hong Kong and China gets easier when you know what you are doing, where you are going, and knowing the expectations of each step of your journey. Initially, the bus and train route to Luohu would be outside my confidence zone, so today’s route is my personal challenge to overcome. The main preparation is having the exact cash for the Hong Kong bus. The A43 bus to Sheung Shui costs HK$ 30.90. The main alternative to having exact cash is a Hong Kong travel card (the equivalent to a London Oyster card). Of course, as a non-Chinese speaker (Cantonese or Mandarin), having your hotel address written out in Chinese characters is essential, unless your taxi driver happens to speak English, or knows the hotel you are staying in. Hong Kong buses and train services use a travel card, so if you are a regular visitor to Hong Kong, this is a useful investment. No travel card means exact change. This was stresses over and over in online notes about using Hong Kong bus services. Hong Kong buses don’t have tickets, it’s either a travel card swipe, or you insert cash into a money box. There is no mechanism for getting change, so without exact amount, I guess paying a little more and not expecting change is probably a viable alternative. I solved the exact cash need by breaking a HK$ 50 note on a HK$ 16 bottle of water in the 7-11 between Terminal A&B. I then gave the cashier a one-dollar coin and asked for 10 cent coins. When I explained I needed 90 cents, he quickly exchanged my one-dollar coin for a 50 cent and 5 10-cent coins. After exiting Immigration/customs at Hong Kong International Airport you’ll find yourself in either in Arrival Hall A or Arrival Hall B. The local transport network entrance is located between these two terminals. So if you find yourself in Arrival Hall B, head for Arrival Hall A, and vice versa. From Arrival Hall B facing Terminal A, the transport links are on the right hand side (the 7-11 and a chemist are on your left). Heading down that wide passage way and you’ll see a host of options, from Mainland travel (downstairs, I covered the SkyLimo/overland bus to Mainland China previously. 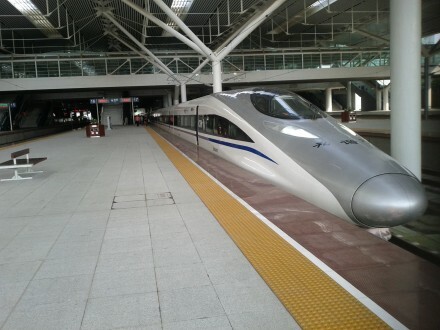 ), high speed rail connection to Hong Kong. 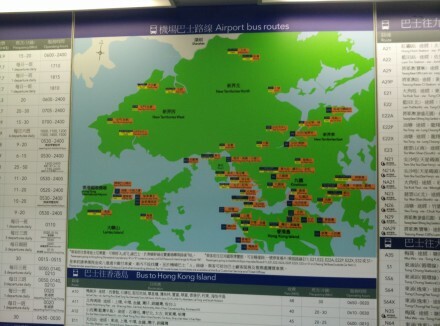 If you look to the right, you’ll see a bus route map of Hong Kong, along with the main details of every bus route that services the airport. Here you’ll be able to find Sheung Shui in the top right quarter of the Hong Kong map, and route information for our bus, the A43. 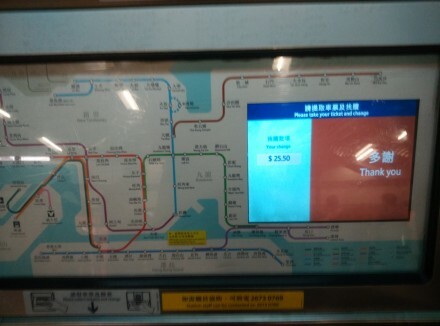 This shows the route name (to Fanling), the price (HK$ 30.90), and the frequency of the service (every 15 to 30 minutes). Going right from here takes you towards the bus depot. This is essentially a really big oval, and busses stop in designated areas for their route. 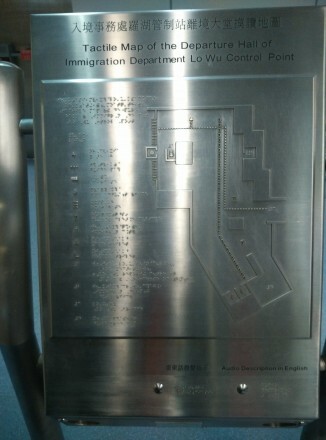 Immediately on exiting the airport building you’ll be faced with a map that shows where each bus service stops. the A43 stops nearest to the building on the left hand side. The A43 bus route only has three stops. 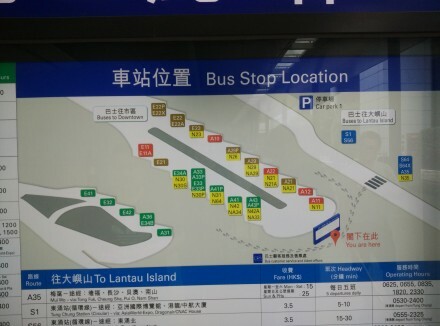 The first one is a request stop at Lantau Link Toll Plaza (about 15 minutes into the trip), then our stop Sheung Shui train station (the bus stops directly outside the staircase/ramp entrance to Sheung Shui station), then Fanling. 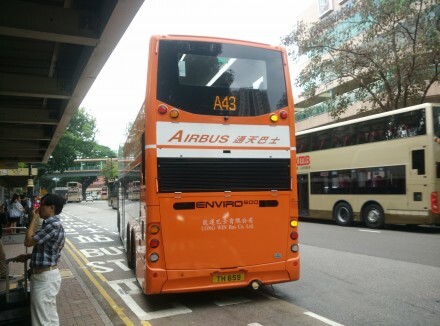 The A43 bus is a double decker orange bus operated by Long Win Airbus. The A43 is quite visible on the back of the bus, so when exiting the airport building and there’s an A43 bus there, you’ll spot it quite easily on the left hand side. Climbing aboard the bus with your luggage, next to the bus driver is a money box with a slot at the top. Deposit your exact change into the money slot. The bus has storage racks on the left-hand side (from the front of the bus looking back), so put your heavy luggage in a space. This tends to get full fairly quickly, so it seems acceptable to manoeuvre other people’s luggage sideways to make space. Find a seat and sit down. I stayed on the bottom deck, because this is my first time, I didn’t want to miss getting off the bus because it took me too long to realise this was my stop, and negotiating the steps to the upper deck. But, next time, I must try the upper deck, because the view across the Hong Kong bridges is spectacular, but the high bridge walls get in the way when you are on normal ground level. The bus crosses one of the epic Hong Kong bridges before heading to Lantau Link Toll Plaza. The bus uses a motorway for most of the journey, it follows the SkyLimo route, but keeps on the highway when SkyLimo turns off for Lok Ma Chau border crossing. We keep going for another 15 minutes before turning off an exit marked as Fanling. After negotiating a long curved off-ramp, turning right, a couple of minutes later the bus arrives at Sheung Shui. Grab your luggage and exit the bus, and you’ll see a light-orange/yellow building in front of you. That’s Sheung Shui train station. The Shueng Shui station was a little busy when I arrived near 4 o’clock. It wasn’t commuter crush level, but I guess it might be starting to ramp up. Entering Sheung Shui station via the ramp and escalator, follow the signs for “Customer Service”, that should take you rightwards from the top of the escalators, and then nearby the first left opens up to ticket barriers. There are cash ticket machines on the left, for tickets. So I gave that a try. In my tired state I went to the machine marked “Coins only”, thinking it means “Cash only”. So I was a bit perturbed that it wanted me to pay $25.50 in coins (no notes slider!). What kind of system would take that much money only in coins? Stepping back to do a second exchange of notes to coins, I quickly realised my mistake. The first machine is coins only, the others take coins and notes (and probably credit cards, I guess). The machines themselves are thankfully as straightforward to use as the Shenzhen Metro ones. You tap the station you want on the map (which takes up most of the screen), and on the right side of the screen you can refine the ticket you want (change number of tickets, adult/child, first class). The instructions on the back show how to use the travel card. It’s as simple as tap on the sensor at the ticket barrier when you enter, and insert into the travel card slot when you exit your station. 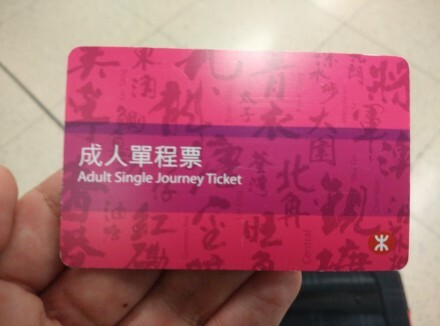 This is similar to Shenzhen Metro’s token use. 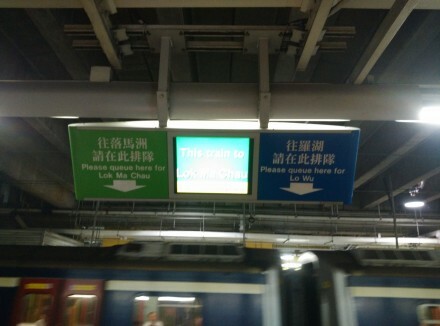 The train station is a little run down, but everything is clearly sign-posted in Chinese and English. Going through the ticket barrier takes a little thought when wheeling around luggage. The barrier is a simple forwards rotating turnstile. So I had to do some crafty arm gymnastics to get my wheeled luggage through. There might be a bigger gate option somewhere, but I wasn’t really looking for it. Through the ticket barriers the platform for Lo Wu and Lok Ma Chau are on the right, and down an escalator to the platform. 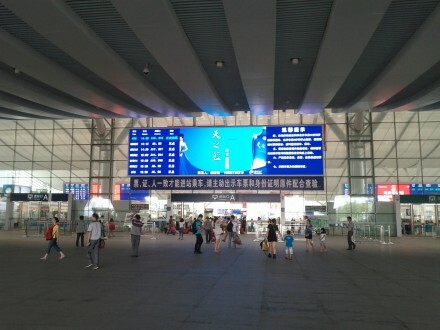 The platforms were buzzing, but the signposts and overhead message boards are in both English and Chinese. One nice extra was a clear message on it’s own where the next train goes. So you’ll be able to determine whether the next train goes to LoWu or not. 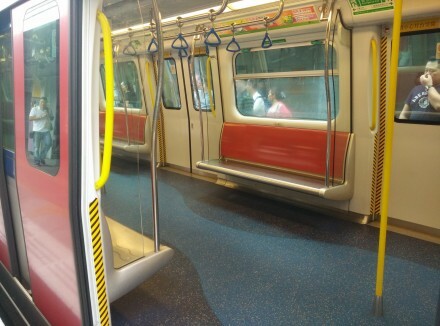 The trains are similar in style to the Shenzhen Metro trains, metal seats down the sides, and considerable floor space. I was expecting to have problems with space (for me, my claustraphobia, and my luggage), but the carriage that stopped in front of me the door areas were thankfully mostly empty so I had no problem getting on with my luggage. 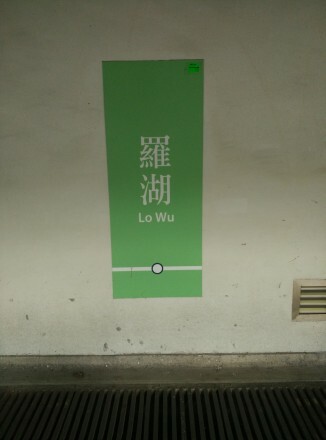 The trip to LoWu takes 10 minutes, and LoWu station is the only stop. The process of going through the immigration station of both Hong Kong and China is very similar to that when going to Huanggang Port via GoGo bus. You have to walk through both sets of checkpoints with all of your luggage. So I had no problems understanding what I had to do. Tackling the Hong Kong immigration checkpoint in my sleep deprived state, I followed the sign for “Mainland visitors”, because I was going to visit the Mainland. The meaning is the other way, this was a queue for people who live on the mainland. A passenger helpfully pointed me to the “Other visitors” queue. Negotiating the Hong Kong immigration checkpoint is just a simple passport and the carbon copy of the landing card you filled in when landing at Hong Kong Airport. Then you walk through to the China immigration checkpoint. I knew that I needed to fill in a yellow arrivals and departures card. The foreigners queue is on the right hand side, and as you approach the checkpoint queue, the right hand side opens up to an area where you can grab and fill in the arrivals/departures card. So fill that in, and the foreigners queue was quite short, and you are quickly through to Louhu. Now it’s time to be careful. It’s easy to spot the Western foreigner in China. He stands out. So you are going to be approached by people offering you a taxi to your hotel. Constantly. They speak English, and understand English, but it takes several “No thank you” and continue walking before they give up on you. It’s worth pointing out, Shenzhen’s registered taxis are either maroon, or blue. They are distinctive and recognisable. And professional service. Get into a car that isn’t one of these official taxis, and you are opening yourself up to being gouged heavily on taxi cost. Heading straight out of the China Immigration building look at the signs for taxis. It’s a yellow square with a car in black. Following this will take you down to a lower level, then straight ahead for a bit. Then you take a right hand turn, then immediately left and you’ll find yourself in a taxi pickup rank and you should see a few maroon taxis coming through. You are in the right place. So queue up. The taxi touts here are more pushy than the ones outside the China Immigration building. They’ll say their service is ready, so no waiting, and you’ll be waiting here for 2 hours for the maroon taxis. I got by with “two hour no problem”, And once I was no longer the last person in the queue, I was left alone. It was only a 15 minute wait for a taxi. Out comes my printed paper with the address of my hotel in English and Chinese. And the taxi driver knows where to go. Because my hotel is close to the border, and near the Mix-C shopping centre, the taxi fare is a default minumum of 10RMB. That’s handy when I have 11 RMB in denominations other than 100RMB notes. In China, all foreigners are required by law to register for a temporary residence permit. The correct document name is “Registration Form of Temporary Residence”. The law requires foreigners (referred to as “aliens”) apply for a temporary residence permit within 24 hours of entering mainland Chinaor moving residences within China. This is 72 hours if you are staying in the countryside). Although the offices are open only during business hours (Monday to Friday, 9 to 5, with a two hour lunch break), so they probably take that into account if you land early on Saturday morning. The penalty of not applying for a temporary residence permit, and it is later uncovered, is a fine up to RMB 5000, possible revokacation of your existing visa. It can also hamper when applying for future visas, be it tourist, or work visas. When staying in a hotel, especially one catering for foreign tourists, this is normally done by the hotel on your behalf when you check in. The hotel concierge will ask for your passport and record your details. If you plan on revisiting China again, it is worth checking that the hotel is doing the temporary residence permit in your behalf. Hotels for Chinese residents may not do this, so do ask. If your hotel does not do the temporary residence permit on your behalf then you will need to do it yourself. So follow along with the process for staying with family and friends. If you are staying with a friend or family, then you have to do the application yourself. This is done at the local police station that covers the area you are staying. Your host should know which police station that is. In Futian, Shenzhen, our local police station has a specific office dealing with residencies. As I understand it some local police stations don’t offer temporary residence permits. If you find yourself in that particular situation, then you need to find the Exit-Entry Administration Department office in your current or nearest city. Two passport-type photos of you. For current Chinese travel visa applications they require colour photos, so to be on the safe side, provide two colour ones here too. The current rental agreement (and a photocopy) of the place you are staying (your host should have this, in their capacity of either renting the premises or being the landlord). I recommend checking with your host that this won’t be a problem; some accommodation in China is provided without paying the 10% tax, and so the landlord may be reluctant to provide necessary details that suggest unpaid taxes. If you are staying in a hotel, then I guess the hotel address and contact details, along with photocopied proof you are staying there would be sensible. A contact phone number, which can be used if authorities need to check any security-related matters. It is practical to use your host’s phone number if you don’t speak the Chinese. Take your host along too. They need to bring their hukou (or in Shenzhen their residence card is an accepted alternative). Also they can help answer any questions/clarifications. Various districts do things slightly differently, including asking a few additional questions. Some local offices may ask for additional information. So make sure you do have time to go in to find out, and quickly get any remaining information and revisit the office. The official guidelines stipulate more information, if you decide to err on the side of caution and completedness. The overall process should take under an hour. When in China foreigners must have their passport with them at all times (correspondingly Chinese citizens should have their Chinese Id with them). Foreigners can use their temporary residence permit instead of their passport, with a few exceptions. 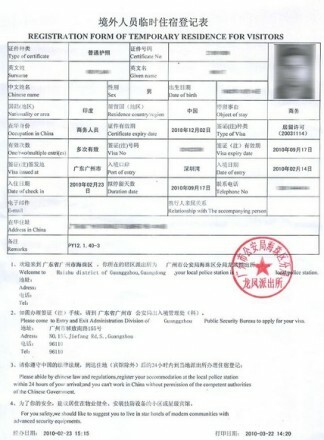 The Futian District in Shenzhen website suggests that if you lose your temporary residence permit you should report it to the nearest police station and get a “Receipt of Case Reporting” in order to renew your visa and passport. And this is to be done at the Shenzhen Exit-Entry Administration Division in Louhu. In December last year China linked up the last piece of the high speed railway line between the two Chinese powerhouse cities, Beijing and Hong Kong. This high speed train reaches speeds in the excess of 300 kilometres per hour, covering the distance between Shenzhen and Beijing (2400 kilometres) in a little over 10 hours. This is a train ride I want to try, as with all geeks, the idea of sitting comfortably surrounded by gadgets while the countryside whizzes past unconcerned at high speed is somehow relaxing, and invigorating. One of the nicest bits of the Eurostar from London to Paris is whistling through the French countryside, just an endless sequence of green, punctuated by little towns and villages just going about their lives. Shenzhen and Guangzhou are linked by China’s high speed railway line, and so it takes just 36 minutes to cover the 120 kilometres, that’s including slowing down for intermediate stops. The train peaks at over 300 kilometres per hour twice in that time, topping out so far at 310 kilometres per hour. And the ride is very smooth. It also feels counter-intuitive as I feel the train is slowing down, yet the speed indicator keeps notching ever upward. There’s no clackety-clack so typical of British railways, no loud engine noise that’s distinctively Eurostar, just a continuous high speed forwards motion accompanied by a gentle roar of the engines. 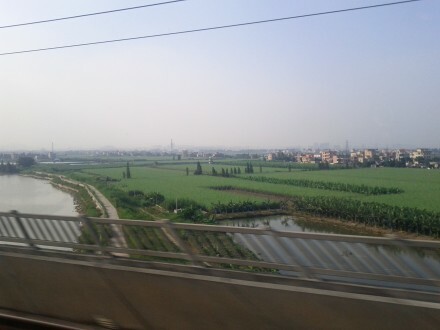 Watching the countryside fly by I get glimpses of China that’s not so obvious from the heavily modernised and urbanised Shenzhen. Rice fields, towns congregated around river banks, three-lane highways carrying lots of industrial traffic, some cultural landmarks slowly losing the battle against modernisation. Some sections of the rail network are spectacular, including miles and miles of elevated track, like a bridge over vast spaces of China, curving gently towards a mountain range in the far distance. 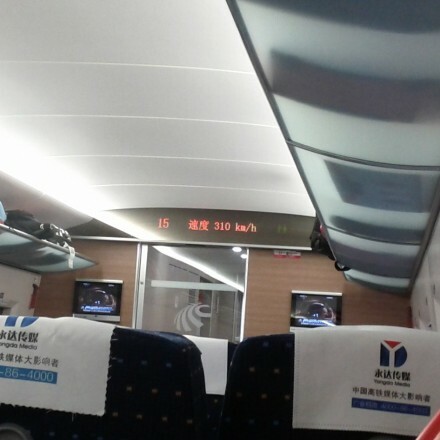 Yet at such a speed that far distance quickly disappears behind us in our ever onward journey towards Guangzhou. You need to bring your passport, or an appropriate travel visa. Go to the ticket office (or ticket machine if you can read Chinese) and buy a ticket. You ask for the time you want to travel and the class, and the staff search for available bookings. Services fill up quickly, so you may not get the time or the class of service you want, but the staff are very helpful in finding the next available service you can take, so some discussion is needed, if only pointing out acceptable train times. Politeness and patience does help. Sometimes the service you want to catch is fully booked. Do expect that to be the case, and have alternative services lined up as backups. You can sometimes buy a ticket for a much later service, and catch an earlier service with it, but that’s entirely at the discretion of the gate keeper. So be polite and respectful, and expect to be turned away. You will need a passport or valid travelling visa to use the train. 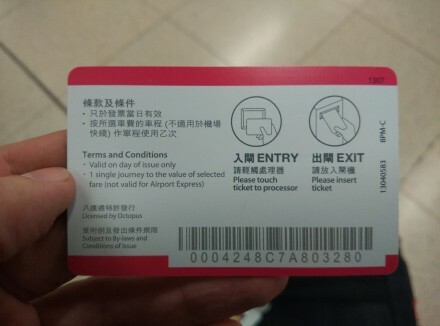 The ticket shows the time of the service, the train service number (e.g. G6421), the platform it is leaving from, the coach number, and the seat number you have been allocated. If your booked train is later, you can try to catch an earlier service, but do so politely, but also don’t expect to have a seat, let alone the seat you booked. You may get lucky, but don’t depend on it. If you catch the train you have a ticket for, your seat is guaranteed. With a ticket in hand, you can enter the departures area. This involves showing your ticket, and then passing your luggage through an X-ray machine, while you get a quick pat-down and body scan. This is a lot more relaxed than airports, and the staff are efficient and mostly adept and guiding bumbling clueless foreigners like me through. Just have some common sense, leave the automatic rifles and hand grenades at home. You are now in the departures hall. Your ticket indicates which platform you are on. For example B17. This means platform 17, entrance B. So far the entrance is either A or B, and the one you take depends on the coach number, so A tends to be the back half and B tends to be the front half of the train service you are catching. Watch the departure boards for your service, not all departure boards cycle through both English and Chinese, so don’t depend on it. Look for the train service id and the departure time, that should be easy to spot and follow. The status of a service is either on-time, boarding, or boarding closing. These are also colour coded as White, Green and Red respectively (I have yet to see a late service, since Shenzhen is a terminal station, so no passing through trains to get delayed). If your train service is Green or Red, go to your platform departure gate immediately. If your departure time is still a considerable time away, there are shops between each platform gate, mostly food and drink, with a sprinkling of trinkets and gifts. Also, there are restaurants and the usual collection of fast-food places in the departures area. Though keep an eye on the time, the train will not wait for you. If you miss your train, you need to change your ticket back at the ticket office. People start queueing up about half an hour before the departure time. There seems to be two sets of queues. But if you have a blue ticket, either queue will work, so I take the natural introvert option and go for the ticket machine gate. The gate allows people through 10 minutes before the departure time, and they close the gate 3 minutes before departure time, so don’t linger around too long. Get your bowel movements and lubrication options sorted before the gate opens. Once through the departure gates, find the right coach, they are numbered from the front to the back. Each coach has an LED display that shows the coach number. Once you’ve found the coach number that matches the one on your ticket, get on and find your allocated seat. The service itself is fairly relaxed, so take your seat and enjoy the ride. The scenery is spectacular. If you have a window seat, and it’s a daytime service, awesome. Listen and watch for the station announcements. One trick I found useful was to write the name of your destination station down in Chinese, that makes things a little less scary when getting off the train. They do announce stops well in advance, punctuated by a two-toned horn. So when the train is gliding slowly into the station it’s time to make your way to the door. When the train stops it takes a few seconds for the door release to trigger and the doors open automatically. Get off as quickly as possible, and get a reasonable distance away from the doors before stopping to have a gawk, or a fumble, or fine-tuning your baggage straps, or have a natter. Activity in stations is managed in bursts, so lots of people will be getting off and on through the door you are using. On the platform look for the exit signs that lead to the arrivals area of your destination station. At this gate you’ll go through another ticket barrier or manual check and arrive in the arrivals hall. In the arrivals hall, which is typically enormous, find your way to the exit appropriate to your next stage of travel. So the Metro, taxi-rank, long-distance buses, parking levels are the typical options. The train stations are spectacular. It’s like someone actually thought about the requirements of a modern railway system. Both Shenzhen North and Guangzhou South are massive structures. I though Paddington was huge, but that’s nothing. The stations take up an enormous amount of space, and much like the Shenzhen Civic Centre, there’s a distinctive feel that this was purposely designed to managed a staggering amount of people every day. The Shenzhen North Railway Station is a massive structure (I guess after two weeks travelling of China I still consider these places huge, it’s a bias of living in London for so long). It consists of 18 platforms. It is at the junction of the Longhua (Line 4) and Huanzhoug (Line 5) Metro lines, and easy to get to from the Futian CBD, and Futian Checkpoints, so great for Hong Kong weekenders travelling to Guangzhou. Getting off the Longhua line and descending the escalators we arrive at the main entrance to the Shenzhen North station. Before entering the departures area you need to buy a ticket. On each side there are ticket machines, unfortunately they are all in Chinese, unlike the Metro with it’s dual language interface. Currently only one of the two ticket offices are open, so far, in my two solo attempts to negotiate through for a ticket resulted in success, but as a chronically shy introvert, I did struggle. The staff at the ticket office were very helpful and patient with me, and I got the ticket I needed. Entering the departures hall you go through a baggage check and quick body scan and pat down. These are routine and nothing to worry about. The departures hall is predictably massive, with four rows of chairs stretching right across from gate A to gate B of each platform. Small food and drink shops are between each platform gate, and the restaurants and fast food establishments are on the level above. The departure board on the far (West) side of the departure hall switches between Chinese and English, but the statuses of the trains are so unexceptional that it doesn’t take long to notice the change from a service being on time to something else, no matter what language it’s displayed in. There are two arrivals corridors either side of the departures hall. The entrance to the underground Metro (Longhua or Huanzhoug lines are on one side, so look for the Metro logo on the various signs. Guangzhou South is a thoughtfully designed structure. The arrivals area has the distinctive features of massive concrete arches running in parallel to the length of the structure. These are the actual tracks, all of Guangzhou South’s 24 platforms make up the structure and roof of the arrivals area. The arrivals area is devoid of shops. The toilets are Chinese style (so be prepared and take your own tissue paper). The main signs of life are on the East side of the station, that’s where the ticket office is, along with a decent coffee-shop (called SPB) and a fast food establishment or two. The departures hall is two floors up. Again, to enter this you have to go through a baggage scan and body scan. 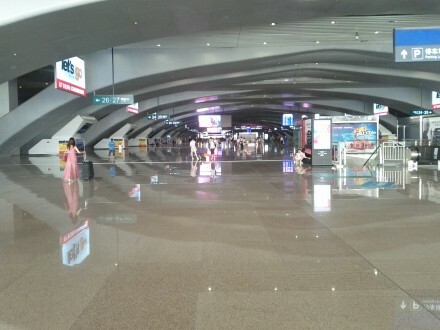 Although, they do regularly let people through to the upstairs restaurant level and shops, so the Guangzhou South station isn’t as strict with who can get into departures as Shenzhen North. But, don’t expect to gain access to the departures level without a ticket, it’s at the discretion of the people manning the security check. The ticket office is on the ground floor. It’s a little bigger than Shenzhen North’s, and despite my trepidation for maybe not understanding English, I managed to buy a ticket there after a little preparation. The onboarding system runs meticulously, the information boards always seems to say either the train is on time, or boarding is now open, or boarding gates are about to close. The whole atmosphere is a well-designed, well-implemented and professional service. It is a pleasant experience, quite like flying was before 9/11. The staff are courteous and accommodating. 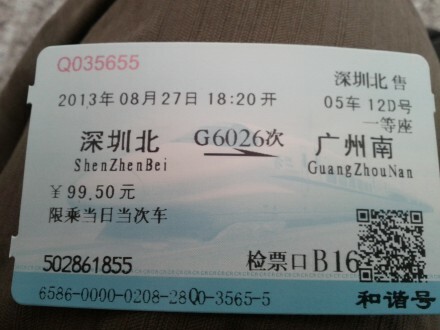 The ticket prices are cheap between Shenzhen North and Guangzhou South. A second class ticket is 75RMB, a first class ticket is 99.50RMB, and a business class ticket is 199.50RMB. The difference in class is, much like an aircraft, more legroom, wider and less seats per row (four versus five for first and second class respectively). First class has better condiments and choice, plus an iPad for every seat with the onboard entertainment, and a folding table instead of a back-of-the-seat variant. Second class still is far better than an aircraft’s cattle class, the legroom is better than business class, the seats lean back, and on a global standard railway gauge, it’s only five seats per row. In all cases the journey is comfortable, pleasant, spacious, and air-conditioned, even when it’s 36 degrees outside in Guangzhou. The quality of the service is top notch. There is no over-crowding of these services, but also, services are regularly booked out. 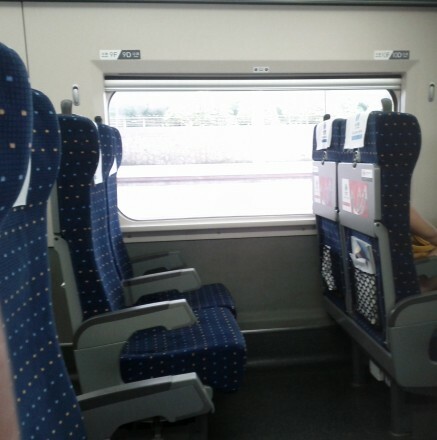 It is a great and economical way of travelling in China. Maybe one day I’ll get a chance to travel the entire 2400 kilometres from Shenzhen to Beijing, and just gawk at the extraordinary engineering effort that went into building this modern marvel. 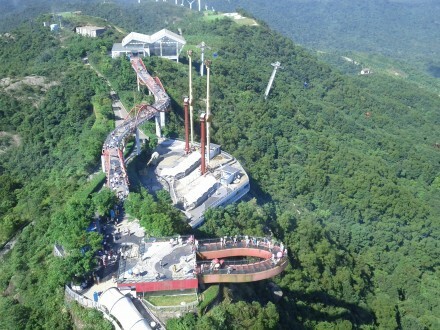 OCT East is another of Shenzhen’s sprawling theme parks, among the mountains east of Shenzhen in the Yantian District. It is a diverse park, so there is something for everyone, from sedate and amusing 3D rides to insane looking rides that make bungee jumping look like a Sunday afternoon hair wash in the sink, and there’s an impressive roller-coaster, and a cable car to the summit of the mountain OCT-East is built around. And a sky tower ride just in case the mountain summit wasn’t high enough for you. OCT East is about a 40 minute taxi ride from the central Futian business district, this costs about 82RMB each way. The other alternative is a bus, as the Shenzhen Metro system doesn’t reach as far east as Yantian. The park is huge, so trying to walk through it in the summer is quite a feat. Luckily there’s a steady stream of golf-carts riding around you can hop on and off. For a 40RMB ticket, you can use the cart 4 times during that day. It’s useful when it’s just after noon and the overall temperatures are hovering around 40 degrees Celsius. 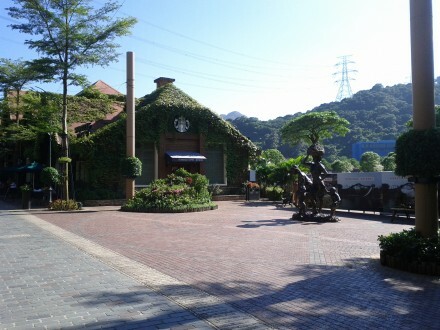 Near the entrance of OCT East is the water park, suitable to keep kids entertained throughout the day. Considering the current average temperature in Shenzhen is in the low thirties, and the post-typhoon humidity adds an extra 10 degrees on top of that, it makes sense to hide in there for a large chunk of the day. After a few sets of stairs we arrive at the OCT Village, which is decked out in a quaint fairy tale style, so green creepers growing on the walls of rustic buildings. There’s a sense of calm on the outside, and yet on the inside we find a bustling Starbucks and Pizza Hut. There’s a lake still under construction next to it, as with much of Shenzhen, it’s a city that’s still growing and accumulating new buildings and features. The rusticness of this village means it’s a regular place for couples to have their wedding photos done. These photos are stylised and carefully choreographed pictures, either taken before or after the actual wedding day. I was hot in the loosest and thinnest clothes in my armoury, I can’t imagine how it felt to be in a tuxedo or wedding dress in the same heat. 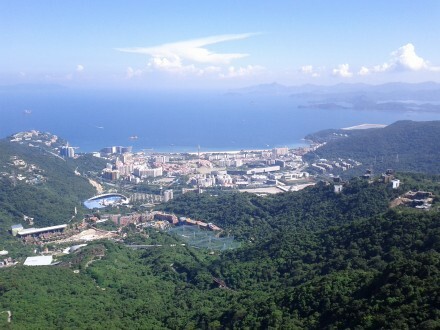 The first ride we tried was a two-person bobsleigh-like series of twists and curves taking us high enough to get some splendid views of the coast and the buildings around the famous Dameisha beaches of Shenzhen. Thankfully, the sleigh is electric powered, with the driver controlling the throttle, no gravity or assisted launch is needed. Like a bobsleigh, the occupants are sitting in very close proximity, the driver’s legs are wrapped around the front passenger, so it’s a cosy ride. The next attraction over is an enclosed space which turns out to be a bird sanctuary. There are a few talking birds there, but they weren’t playing along today. Regularly there’s a bird show going on, this is an entertaining demonstration of trained birds. With the typical fare of repeating words, riding bicycles, lifting barbells, and walking on a rolling drum, there are some clever demonstrations going on like birds working out the answers to addition or subtraction by picking up the square with the right answer on it. Even more clever is the money demonstration, where a bird can collect the requested bank note correctly, as well as the more amusing exchanging a small denomination bank note to a bigger one. A 3 minute ride on a mining cart though a series of 3D iMax style movies is cleverly done, through a combination of spinning the mining cart around the 3D scenes almost blend in seamlessly into the physical rocks. As we dig ever downwards with a nearby digger, we break through into a place where dinosaurs still roam freely and aggressively pursue us out. Then we discover a massive Mayan temple, but as ever-curious our team is, we trigger off a detonation and we don’t have much time to escape before everything around us collapses. Luckily we make it out of the tunnel just before it collapses shut. Hopefully the people on the next mining cart have better luck than us. There’s a steady stream of cable cars to the top of the nearby mountain. I’d like to say the views from the cable car run are impressive – and they are – but as you go ever higher, the views just get better. 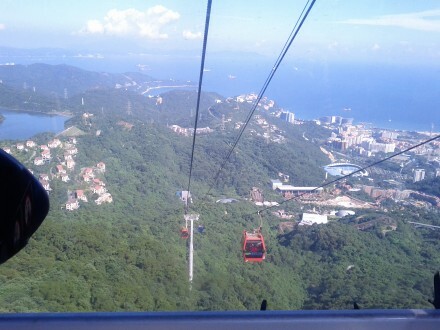 The cable car ride is smooth and fairly quick, with the typical lurch to a stop at either end. The summit is breathtaking. 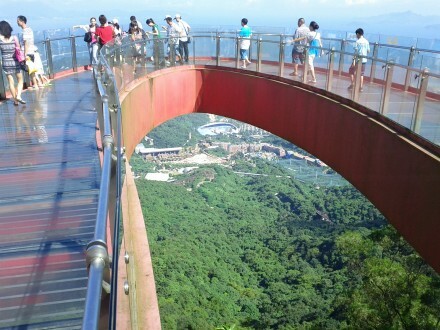 There’s a bridge walkway to a funicular. This is a platform that’s almost hanging mid-air – like a floating shelf. So you feel like you are suspended in mid-air looking down at the tall buildings that make up Shenzhen’s eastern coastline. In the distance you can see the mountainous coastline that makes up Hong Kong, the massive Shenzhen shipyard, and a number of gigantic ships navigating their way through. From the top of a mountain all the way down to the coastline and beach, straight past the waters of the Perl River Delta, right through to the coastline mountains on the North side of Hong Kong, on a clear or even slightly misty day this view is incredible. If you need more excitement than that, there’s a terrifying-looking ride that consists of sitting at the end of a long pole and being rotated around at not-very-gentle speeds. About half the time you are upside down, so if you like mountain top views, while in a gyroscope, being tossed around like a salad, and just being stuck at the very top for a few minutes while they change occupants on the other side of the long pole, well, if that appeals to you, then this is most certainly the ride for you. A little more sedate is the Sky tower, which is a circular platform that twists as it elevates. It’s like Seattle’s Space Needle, except the platform rises and falls as part of the ride. 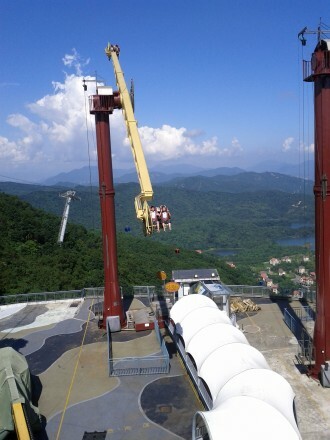 The funicular platform itself is suspended in mid-air. There’s a little warning sign that no more than 50 people at a time should be on it. Thankfully, I don’t think we were anywhere near it. Slightly disconcerting is the semi-opaque glass floor, I managed to walk along that path, gingerly. I don’t like walking on glass, so a couple of deep breaths, and it was well worth it. The views from it are stunning. OCT East is a fascinating place, something for everyone. From rides and spectacular views, to bird sanctuaries and journeys to the centre of the earth. It is definitely a family theme park, and definitely worth spending a day or two experiencing. Shenzhen doesn’t have a London-like A-Z that I could find. And since it’s a relatively new city growing in leaps and bound, maps are very quickly going to be out-of-date, inaccurate, or missing useful travelling information (e.g. Metro stops). So I looked out for a few alternatives. At the most primitive, the day before I flew out, I went to Google Maps, full-screen on my 27″ iMac, and took multiple screengrabs of the Google Maps’ view of Shenzhen, and copied them to my netbook and my Nexus 7. That way. I also took screenshots of chachaba’s 3D map of Shenzhen. In a city of uniquely architected skyscrapers, it’s going to be a useful navigation cue if the signs are unreadable to me. So worse case, I have a digital static map offline if nothing else worked. The Android Google Maps app offers saving maps offline, so I saved an offline copy of a map that covered all of Shenzhen I was likely to visit. It’s a 28Mb download. I saved offline copies on my Nexus S phone, and my Nexus 7 tablet. The phone download refused to complete, so it was unusable. The tablet proved the right device for an offline Google Maps. The offline capability did work on this device, so I had a static map I could pan, scroll and zoom through. But the finding my current location didn’t work for me, it kept insisting it needed a data connection. So this is an improvement on the digital static map offline, but not by much. I bought a second-hand phone off eBay a few weeks ago, it’s an HTC Desire Z. I bought it with the idea of getting a Chinese sim card during my stay, and one with a data plan, so I could use it with Google Maps. From serpentza’s video on buying and topping up sim cards he was using this phone, with Google Maps using a China Unicom sim card. So I aimed to replicate that. I know the Desire Z is an old phone, but with a flip-out keyboard it’s an interesting device, and I’d feel safer carrying around a second hand phone than say, and iPhone 4. Now, I didn’t get to the point of buying a sim card – I needed someone to help me with that. But, I discovered something unexpected. HTC have their own map application called Locations. It’s not available on the Android App Store. This application is awesome. Locations allows you to download high-quality maps of a list of cities and areas. I downloaded maps for UK, Hong Kong, and Guangdong province (where Shenzhen is). These maps are big, about 280Mb for Guangdong. Locations offers a 2D and 2.5D “driving” map perspectives. It works offline. It works with GPS on the phone (without a data-plan or sim card), so you can get the phone to show you a 2.5D map of where you are right now. The second very useful feature is a compass, and the map rotates as you turn around. So you see the map as you see the road in front of you. It works quite well while driving too, so what you already have in a TomTom or Garmin device. That’s what Locations brings when offline. The combination of an offline map that works with GPS and rotates based on a compass is a killer set of features for the geek traveller. It’s what made me exploring Shenzhen possible. So everyday, I took both my phones with me, my Nexus 7 to take pictures, and the HTC Desire Z for navigating. I’ve accidentally uncovered a gem in the HTC Desire Z – well I guess any current HTC phone has these features. But it’s the HTC-specific app, Locations, that melds everything together into a very capable and handy tool for me. Although there are a few little gotchas with GPS positioning in China. There are mutterings online that GPS location services are out by about 40-100 meters in China. I don’t know if this is the case. Every once in a while the app suggested I was located several miles out in the South China Sea. It was only when I was at the Futian Checkpoint yesterday I figured out what the problem was. The Guangdong map ends right at the Shenzhen/Hong Kong border, everything outside of Guangdong is blue, like the South China Sea. At Futian Port, the phone kept flipping to the Hong Kong map. So there is some resolution inaccuracy in GPS signals. And it gets very noticeable when you are at the edge of a map. Perhaps if HTC could extend their Guangdong map a little distance outside of Guangdongs’ borders it would mitigate this problem slightly. I thought skyscrapers may present a problem, and sometimes the GPS would tell me I was a block or two further away from where I knew I was. These little niggles happen, but overall I found it got my location right a lot more than it got it wrong. But I took care to be in an open area, not too close to skyscrapers. You know, just be logical. I didn’t get to a working data plan. With the usefulness of the HTC Desire Z plus the Locations app I really didn’t need it. So being an introvert, and the need to know where I am, I had sufficient options to allow that. Certainly, not needing to ask for directions avoids the language barrier and the introvert barrier. Left to my own devices, and my devices succeeded. 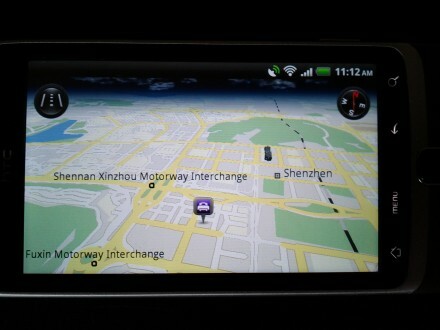 But, only because of HTC’s Location app on an HTC device with working GPS, compass, and enabled offline maps of Shenzhen. Travelling has improved considerably since the days of fold-up maps, and visiting a newly created city means the symmetry of design is pretty consistent, so there were no real surprises to worry about. Me and my GPS. Thanks HTC! 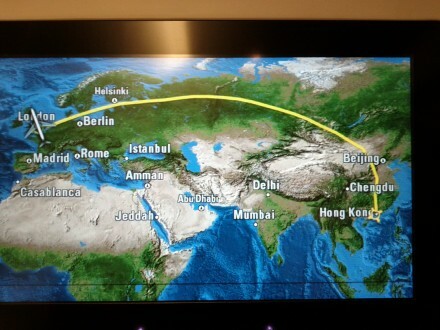 I spent Thursday trying to figure out how to get from my hotel in Shenzhen to Hong Kong International Airport. Again, the ferry was a tempting route, but still too much uncertainty, and I didn’t have the time to get to Shekou and scout around and recon, nor was I confident about my knowledge about how it works. I looked around for a bus that picks up from my hotel, and I did find one, but it was every hour, and exits via Shenzhen Bay, getting to the airport after a 2 hour trip. Other information was very limited on line, like the cost and how to know what bus to get. I dug back into the Web about the Huanggang Border Checkpoint, since that’s where I entered Shenzhen, it made sense there should also be a reverse route back. Huanggang is the largest border point in Shenzhen, the Hong Kong side is called Lok Ma Chau. It’s the primary route for pedestrians crossing the border. Make your way to the Lok Ma Chau control point on the Hong Kong side through their passport control. There are a number of ways through that process, including a full customer service limousine experience costing 1700 RMB (about £190) right down to doing it on foot (effectively free). I think how it works is that everyone has to go by foot through the Shenzhen passport control. Then on the departure side of that you can get on a bus, taxi, people carrier to the next stages. The bus that stops as Lok Ma Chau sounds tempting, but there is a risk you need to be aware of (judging from the comments and stories on the web). 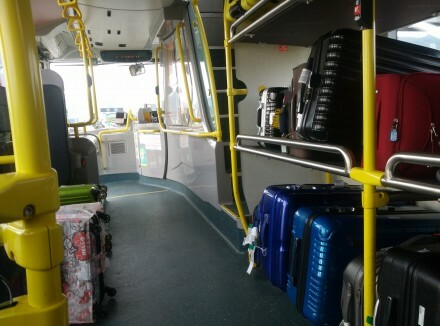 You store your luggage on the bus, and at Lok Ma Chau you have to get off the bus to go through the Hong Kong Passport Control, leaving your luggage on the bus. If you get held up, or take longer than expected through the Hong Kong Passport Control, the bus is liable to leave without you, with your luggage still on board. It isn’t obvious then how to get your luggage back, or whether you have to pay for another ticket on a later bus. That wasn’t a risk I was prepared to take. Another idea I had was to take the Metro from the hotel to Huanggang Checkpoint. So I gave that idea a run on Thursday, went from the Shopping Mall Metro station, to the Exhibition Center Metro station and then changing to the Longhua line for two stops down to Futian. I hoped there would be an easy access to Huanggang from the Futian Checkpoint, but I didn’t see it. And I don’t know enough about Futian Checkpoint to figure out how to get to Hong Kong International Airport from there. So I scrapped the idea of using the Metro. Using transportation other than the Metro, then Huanggang is the logical choice for people in the Futian district. Louhu has it’s own border crossing, which is ideal for cross-border shopping trips in either direction. People in Shekou, the ferry is a useful alternative if your airline allows a check-in from that ferry port. There’s also what looks to be a scheduled bus route from certain hotels to Hong Kong International Airport via Shenzhen Bay, but details are a little scarce. The price looks about right (RMB 150), and the trip takes 2 hours. So my plan was to take a Shenzhen taxi to the Huanggang Checkpoint, get through passport control, buy a ticket for a people carrier there. So almost the same method I entered, in reverse. The benefit of taking a people carrier service is that you and your luggage stay in the car through Lok Ma Chau, and the driver takes your passport and gives it to the controller at the drive-through checkpoint. That should cost me whatever the taxi fare is, plus another 170 RMB for the people carrier. My hotel, Marco Polo Shenzhen, got me a taxi and told the driver where to take me. Perfect. I was in Huanggang Checkpoint inside of 20 minutes from leaving my hotel. I was dropped off on the drive-through drop-off which is on the level above the ground floor, and the departure passport control in on the ground floor (judging from the signs). Going down the escalator I was greeted by a guy offering transport to Hong Kong International Airport, I though he was guiding me to departures, but he was actually selling me a ride from Shenzhen departures to Hong Kong International. After establishing the price (150 RMB), that it would take me all the way to Hong Kong International airport, and someone would meet me the other side of Shenzhen passport control, I handed over the cash and got back a blue sticker for my t-shirt (so that staff on the other side could spot me), and a printed receipt clearly showing the amount paid and the destination. (Another thing to be careful is not to rent a people carrier for yourself, that will cost about 1700 RMB because you are paying for exclusive use of a people carrier. Prices around 150 RMB and 170 RMB mean you are travelling with other people, and that’s the way to go). Then entering the departure lobby I got a bit lost looking for a Tourist or Foreigner lane because every other lane said “Chinese National”, until you looked away and looked back, and some of them say “Foreigners”. I had the wrong mental model (entry in Shenzhen they have separate aisles for foreigners and Chinese Nationals, so I assumed it would be the same thing). Leaving the distinction is made for groups (like tour groups), and individuals. The staff at Huanggang noticed me having my lost face on, and politely guided me to the right queue. It took about 30 minutes of queue shuffling to reach a passport control counter. Hand over my passport, and departure slip (the smaller part of the yellow slip I received in Hong Kong International and filled in en-route to Shenzhen 5 days before), and my best effort “Ni Hao”, the slip and passport were stamped, and I received my passport back. Then through the “Nothing to declare” channel of customs, and through a busy exit. Again, the staff of the people carrier travel service (the same Go Go Bus company I used to get me to Shenzhen) spotted me and guided me to the car that would take me to Hong Kong. There were already five people waiting, which means there wasn’t long to wait before we got started. We were in a 7 seat people carrier, but were quickly moved to a six-seat one, since then we had a full complement of passengers going to Hong Kong airport. I quickly filled out the Hong Kong arrivals slip that the travel service company provided me with (the same type I filled out on the flight to Hong Kong, a triplicate departure card), and handed that along with my passport to the driver just before we reached the Lok Ma Chau checkpoint. I was in the backseat this time so I could see the process. Driver hands over all the passports, which the clerk visually checks the picture with each passenger, and then takes the main copy of the departure card. While he is doing that the main passenger door is open and a security guard pointing a sensor of some sort at each passenger in turn. Then doors closed, passports handed back and we are on the highway toward Hong Kong International Airport, via Tai Lam Tunnel under a mountain, and three suspension bridges between the islands and mainland that makes up Hong Kong. We were dropped off outside Terminal 1 of Hong Kong International Airport. So about 2 hours door-to-door. And it went far smoother than I expected. Hotel checkout not being open, or there was an issue in checking out. getting off the bus/people carrier and going through Lok Ma Chau by foot with all my luggage, that could be just as busy as the Huanggang Checkpoint. If I caught a bus, and got delayed at Lok Ma Chau, finding another bus or taxi there to get me to the airport. Hong Kong Taxi from Lok Ma Chau to Hong Kong International Airport quoted cost about HK$250. So I gave myself about 7 hours for the journey from my hotel room to Terminal 1 in Hong Kong. And it was plain sailing all the way and took only 2 hours almost stress-free. Now I can relax, and try to figure out how I’m going to deal with flying against an 8 hour time-zone difference. I’ve been up since about 7am Shenzhen time, and will get home about 11pm UK time, so I am living a 24 hour day today. Only 20 more to go. It will be at least another hour before I can check in my main luggage. 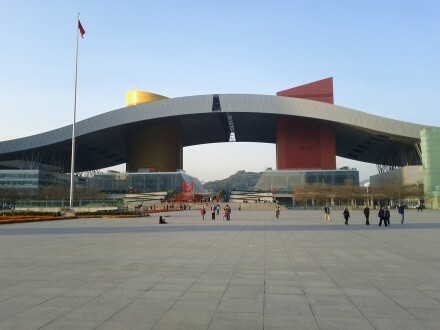 I spent this afternoon walking around the Shenzhen Convention and Exhibition Center. It is one of the most recognisable buildings in Shenzhen, and is the heart of Shenzhen. It’s about five or six blocks from my hotel, but with the ongoing construction work there isn’t a straightforward route to it. At least the Exhibition Tube station means there’s a subway underpass for pedestrians under the busy Shennan Avenue. From a distance you can see the distinctive architectural curves of the Exhibition center. What you don’t realise is that on the south side is a massive plaza. Nor do you realise that on the North side is a very wide path from the exhibition center to Lianhuashan Park. Emerging from the subway you are greeted by a huge square plaza. Crowds of people were there taking tourist photographs, as well as groups of people rollerblading. It is an ideal spot for rollerblading, flat, smooth and huge. As you climb the steps of the Conference center you start to see the immense size of the space. The entire space is raised above the street level, so it covers about 6 city blocks right into the Park at it’s northern most point. The conference center itself is quiet, but all around there are families enjoying the day outdoors. There’s a group of guys breakdancing under the vast roof. Kites are a popular outdoors activity in Shenzhen. I first noticed them when trying to find my way to Lianhuashan Park on Monday evening. It’s the busiest place in Shenzhen this week, as crowds of people are picnicking there while their kids are flying kites. That’s a pleasant surprise. I saw a guy on a bicycle selling turnips. How odd, I thought. Then a few minutes later there was this fabulous smell wafting through the plaza. Do roast turnips smell that good? People we buying them. Since this is the biggest gathering of people I’ve been with during my trip, I got quite a few looks, and greetings because I obviously stand out. It’s been fine, it’s all been very lighthearted, very welcoming, it’s just curiosity. One kid asked to take a picture of me the second time our paths crossed, so I did my best Spock greeting. The moments I’ve enjoyed are seeing kids and their parents together, in shopping centres, in theme parks, in open-air plazas, in parks. There’s something refreshing, that I don’t see in the UK any more. I admire that, that sense of family, that sense of togetherness. I’m most likely being naive, but isn’t that what naivete is, looking for the good side of things. And maybe sometimes, you do find it. Not all the time, but when it counts and when it matters.